Welcome to the KHWiki's mobile site! To browse the wiki in its entirety with all features enabled, visit the desktop site. The Kingdom Hearts encyclopedia that anyone can edit! The Kingdom Hearts Wiki has 4,020 articles since April 2006! Long ago, the World was filled with light. The Master of Masters gave five of his apprentices a Book of Prophecies, which foretells the inevitable destruction of light, and then disappeared, along with the sixth apprentice. The five Foretellers then created Unions and recruited Keyblade wielders to fight the darkness and protect the light. An hour-long cinematic released as part of Kingdom Hearts HD 2.8 Final Chapter Prologue. Long ago, the World was filled with light. People loved the light. But bright light casts shadows that beget darkness. Darkness brings anxiety and fear, and war. To protect the light, Keyblade wielders traveled to different lands and sought to collect the light, hoping to have the power to push back the oncoming darkness. The remake and sequel to Kingdom Hearts χ. 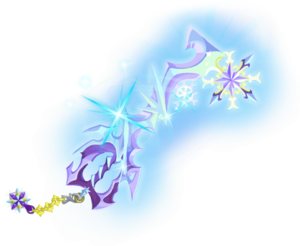 Originally called Kingdom Hearts Unchained χ, the story continues from the perspective of a Dandelion, one of the Keyblade wielders chosen by Ava to avoid the Keyblade War altogether and ensure the light's survival. "Three friends, three destinies. Everything will link back to the beginning." Terra, Aqua, and Ventus are aspiring Keyblade Masters, but a strange new enemy, called the Unversed, threatens the Realm of Light, and a boy in a mask seems to be behind it all. But does the absence of Master Xehanort, a Keyblade Master, have anything to do with it? As Sora, Kairi, and Riku prepare to explore the world on a raft, darkness destroys their world. Meanwhile, King Mickey of Disney Castle has gone missing, leaving Donald and Goofy to find "the key." The search for King Mickey and Riku takes Sora, Donald, and Goofy to Castle Oblivion, where they confront a mysterious Organization and learn of a long-forgotten friend. Meanwhile, Riku awakens inexplicably in Castle Oblivion's basement. "What mattered the most was remembered the least." In its quest for Kingdom Hearts, Organization XIII takes in two new members, Roxas and Xion, who become quick friends with Axel. Meanwhile, the restoration of Sora's memories has come to a complete halt, threatening his awakening, and an imposter has emerged sporting the Organization's black coat. A young man named Roxas keeps having dreams of an adventure he's never had and a boy he's never met. And now, there's a girl named Naminé he's running into. 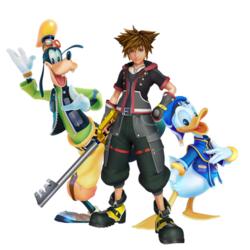 And Sora, Donald, and Goofy soon face new enemies and the mysterious Organization XIII, that is, if they can ever wake up. Having just returned from their journey, a mysterious message appears in Jiminy's Journal from their first adventure, a journal that was supposed to be completely empty but for one line. To investigate, King Mickey has the journal digitized, but they soon find the journal infested with bugs. There is but one person ready for the job, and he's already in the journal. After falling to the darkness to save her friends, Aqua continues her journey through the Realm of Darkness, seeking to return to the Realm of Light. But she soon finds that the Realm of Light isn't as secure as she had left it. Released as part of Kingdom Hearts HD 2.8 Final Chapter Prologue. 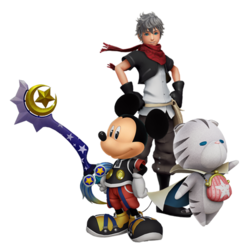 In an effort to undermine Xehanort's plot, Sora, Donald and Goofy search for seven guardians of light and the “Key to Return Hearts,” while King Mickey and Riku search for previous Keyblade wielders. Re-release of Kingdom Hearts Birth by Sleep with additional enemies, gameplay, and a new secret ending. Re-release of Kingdom Hearts with additional enemies, gameplay, and a new secret ending. Remake of Kingdom Hearts Chain of Memories with full voice acting, full computer graphics, and additional content. Remake of Kingdom Hearts II with additional enemies, gameplay, and a new secret ending. Remake of Kingdom Hearts coded with full voice acting, full computer graphics, and additional gameplay, and a secret ending. Remake of Kingdom Hearts 3D: Dream Drop Distance with high-definition graphics, new gameplay interface, and additional content. Released as part of Kingdom Hearts HD 2.8 Final Chapter Prologue. High-definition remake of Kingdom Hearts Final Mix and Kingdom Hearts Re:Chain of Memories with Kingdom Hearts 358/2 Days remade entirely into full cinematic cutscenes. High-definition remake of Kingdom Hearts II Final Mix and Kingdom Hearts Birth by Sleep Final Mix with Kingdom Hearts Re:coded remade entirely into full cinematic cutscenes. Enhanced ports of Kingdom Hearts HD 1.5 ReMIX and HD 2.5 ReMIX for the PS4. High-definition remake of Kingdom Hearts 3D: Dream Drop Distancealong with a brand-new chapter titled Kingdom Hearts 0.2 Birth by Sleep -A fragmentary passage- and a sixty-minute cinematic film based on Kingdom Hearts χ[chi] titled Kingdom Hearts χ Back Cover. A service released in Japan for the Docomo Prime Series-P-01A cell phones. It is portal where people can play minigames or download ringtones, wallpapers, and other things related to the Kingdom Hearts series. A Kingdom Hearts game that was developed exclusively for V Cast, Verizon Wireless's broadband service. It was released on October 1, 2004 in Japan and on February 4, 2005 in the United States as one of the launch games for the V Cast services. An online flash game released to the Disney website by Square Enix and Disney, made to promote Kingdom Hearts 358/2 Days. A flash adaptation of the mobile Gummiship Studio made for Facebook by Square Enix, made to promote Kingdom Hearts Re:coded as well as gaining new members for the North American Square Enix website. A Kingdom Hearts game that was developed exclusively Playstation VR. It was released on January 23, 2019 in Japan and on February 28, 2019. November 10, 2018 - It has been confirmed that the Hundred Acre Wood and the Winnie the Pooh characters will be returning in Kingdom Hearts III. October 5, 2018 - It has been announced by Square Enix that a new Kingdom Hearts combo pack is coming out for the Playstation 4 on October 30, 2018 in North America only called Kingdom Hearts: The Story So Far, which will be a 2-disc release that will contain both Kingdom Hearts HD 1.5 + 2.5 ReMIX and Kingdom Hearts HD 2.8 Final Chapter Prologue. June 11, 2018 - The coverage at E3 also confirms that Pirates of the Caribbean will be returning for Kingdom Hearts III, using material adapted from Pirates of the Caribbean: At World's End. June 10, 2018 - It has been confirmed that Kingdom Hearts III will be released on January 25, 2019 in Japan, and January 29 for the rest of the world. In addition the trailer from E3 2018 confirms that Frozen will be present in that game as a new world. "I'd rather we just skip the formalities." 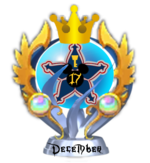 New to the Kingdom Hearts Wiki? Want to help out but not sure where to start? Check out Traverse Town, our community portal, to get started! Start in the First District! If you're a new editor, check out the First District of Traverse Town for all the information you need! Find help pages in the Restaurant and learn all about the wiki in the Accessory Shop! Join the cause! Help finish projects in the Third District! The Third District has all of our running projects on the wiki. Check it out to see where you can help us out! Check out the rest of Traverse Town! If you're new to the wiki, aren't sure how to help us out, or just want to meet the community, check out the rest of Traverse Town to get started! Join us in our community events! Vote in this week's match in the Mirage Arena! Check out the latest issue of the wiki's Magazine and Podcast! Check out the latest episode of the wiki's Let's Play series! Check out this month's Featured Project! This month's featured project is Project χ! Project χ focuses on improving our coverage of all things related to Kingdom Hearts χ, Kingdom Hearts χ Back Cover, and Kingdom Hearts Union χ! If you play any of these games, then this project is for you! Learn more about the Featured Project at the Secret Waterway in Traverse Town! This page was last edited on 14 March 2019, at 03:19.